Clinton O. “Casey” Sander is an actor, born on 6th July 1956 in Washington D.C., USA, who is best known for his role as Jimmy Wennick in TV series “Tucker”, but other notable appearances have been in TV series “Criminal Minds”, “Grace Under Fire”, “The Golden Girls”, “Malcolm in the Middle”, “Rules of Engagement”, “Buffy the Vampire Slayer”, “Hunter” and many others. Have you ever wondered how rich Casey Sander is? According to sources it has been estimated that Casey Sander’s overall net worth is $400,000. He has acquired most of his wealth thanks to numerous performances in popular TV series, but his appearances in various films have also added to his net worth. Although he was born in Washington D.C., Casey went to Nathan Hale High School in Seattle. Sander was mainly interested in sports and was a promising athlete, so he played in the school’s baseball team from his second year. After graduating in 1973 he was accepted as a round draft pick for the California Angels, but was later released due to an unsuccessful season. He then attended Roosevelt High School together with Richard Karn, against whom he played on the football team. Since he was released from the Angels, and finished a season for the Seattle Rainiers, he decided to accept a football scholarship he was offered from the University of Puget Sound. It was while he was at college that he first started taking acting classes hoping it would improve his performance, and in order to become a sports broadcaster. Subsequently Casey was involved in several college plays including “Waiting for Godot” but didn’t continue to pursue an acting career straight away. Sander did different jobs, such as a bartender, car dealer, shipyard hand and appeared in countless advertisements before finally getting an acting agent. He had his first serious job in print advertising, and became the “Winston man” in the advertisement for Winston cigarettes. 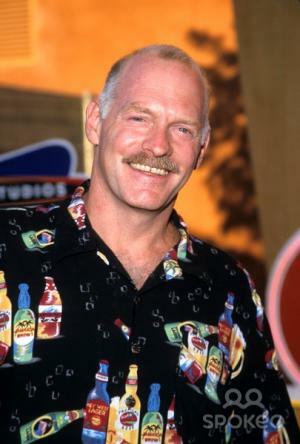 However, his acting career took off after moving to California in the early ’80s, when he joined with “The Groundlings”, a comedy sketch troupe and school in Los Angeles. His first speaking part came in 1982, in an ABC action/adventure television program “The Fall Guy”. Since then, Casey has built a successful career comprising over 300 performances in TV show episodes, 25 movies of the week and 18 feature films, also being a voice-over artist. His biography is indeed lengthy, and includes guest appearances on TV shows like “Malcom in the Middle”, “Dynasty”, “Punky Brewster”, “Knight Rider”,“Who’s The Boss”, etc. His best known roles are probably in “Home Improvement”, and “Grace Under Fire”, in which he was a regular cast member and won a People’s Choice Award for “Best New Comedy” in 1993. Apart from this, another essential role of his was that of Capt. Dan Gruber in the 2006 crime thriller film “16 Blocks”, in which he starred alongside Bruce Willis. Onee of Casey’s latest acting engagements involves his recurring role in “The Big Bang Theory” TV series, as Bernadette’s father. In his personal life, Casey is a divorced father of two children, and leads a peaceful life. As an ex-professional baseball player, he has used his popularity and athletic past to participate in sponsoring charity events, which have donated over a million dollars to cancer research. TV Shows “Malcom in the Middle”, “Dynasty”, “Punky Brewster”, “Knight Rider”,“Who’s The Boss”, “Home Improvement”, “Grace Under Fire”,"The Big Bang Theory"
1 I live a normal life, I get up at 5:00, fix my kids breakfast, dabble in the stock market and get off to work at 6:40 when I'm called. I'm looking forward to working with Bruce Willis, but I'm not Bruce Willis. I'm not Tim Allen. I've been around the crazy feeding frenzy, but I've never, ever had to deal with that. I'm not a big enough star to cause that sort of hysteria. I've seen it and don't get it, I'm sorry. I get recognized all the time, and that's fine. I'm proud of it. But I don't have to live a secluded life. 1 Sander was up for an EMMY in 2016 for his memorable Guest Star performance in "Grey's Anatomy". 2 Has played a police officer on three sitcoms: The Fresh Prince of Bel-Air (1990), Grace Under Fire (1993), and The Big Bang Theory (2007). 3 After his baseball ending eye injury, Casey attended the University of Puget Sound where he played football through 1978. 4 Sander has known his talent manager, Gigi Garner, daughter of Hollywood icon James Garner, for 30 years. 5 Richard Karn and Casey attended Nathan Eckstein Junior High in Seattle together, though Richard was a year behind. Casey found this out while on the set of Home Improvement (1991) when Richard told him. 6 Gave up a Football scholarship to the University of Washington and Washington State University to pursue his dream to be a Major League Baseball player. 7 Played Minor League Baseball in the Angels organization with teams in Idaho and Iowa before injuries caused him to be released.